It’s apparently a backward day in DC town; its crown jewels, including the iconic fight between Batman and Superman, turned into a snore-fest, while one of its least beloved heroes exceeds expectations and could herald a Warner Bros. comeback after a series of superhero flops. Let me clarify one thing: I do not think James Wan’s “Aquaman” is even remotely close to being a superhero masterpiece, or even on par with “Wonder Woman,” the highest-rated movie on Rotten Tomatoes that is based on characters by DC comics. It has an abundance of flaws, from rushed character development to cheesy moments to a substandard plot and bloated run time. Sounds familiar? It should, as these are some of the problems that ailed the 2017 “Justice League,” one of the most anticipated superhero films of all time encompassing basically the most popular characters in the DC universe. Yet, “Aquaman” -- despite being 20 minutes longer than that bellyflop of a film -- works because the goofiness and cheesiness match the tone of the main character. Also because Wan, noted for talent in creating suspense and tension in soon-to-be-horror classics, managed to create a world that is visually stunning and a story that is swashbuckling fun. The story follows the titular character Aquaman -- aka Arthur Curry, played by Jason Momoa -- who spends most of his days lending a helping hand to those in need at sea. Born half human and half Atlantian -- a meta-human race living in the underwater world of Atlantis -- he possesses superhuman abilities and a dark past of being the reason his mother is dead. From the get-go, it sends waves of awesomeness and dumbness to the audience. When pirates raid a submarine, Aquaman emerges from the depths and lifts the entire submarine to the surface. He then beats up the band of pirates in one of the most badass action sequences since Batman’s short-lived glory in “Batman V Superman: Dawn of Justice.” In the process, he poses, smirks and delivers a one-liner like a kid in a high school play. The film is very goofy, but the reason it wasn’t so annoying was because of Momoa’s performance and natural looks. At 193 centimeters and packing a ton of specs, his version of Aquaman looks like a brute but acts like a very overgrown, playful high school kid. Unlike “Justice League,” in which the sudden playfulness of “Dark Knight” Batman mutilated the tone of the film, the film’s silliness plays out quite well because Arthur himself is very silly. He is the kind of person you would expect to say and do dumb things, and just have the time of his life. I also liked that Wan minimalized the teenage angst that often comes up in films in which the protagonist has an identity crisis. While the character development surrounding Arthur’s tragic backstory was rushed, it still worked because of the visual imagery and the power of acting. The relationship between his mother Atlanna -- former queen of Atlantis played by Nicole Kidman -- and Tom -- played by Temuera Morrison -- is short but portrayed with heart. The visual imagery plays a big role, namely the sight of Tom waiting by the docks till the rising sun for his long-lost wife. Chemistry between the cast is not bad. Amber Heard as Mera is a strong-willed, powerful female character that is pretty standard in today’s superhero genre, but her quarrels with Arthur during their adventure are quite fun to look at during the buddy-film portion of the flick. 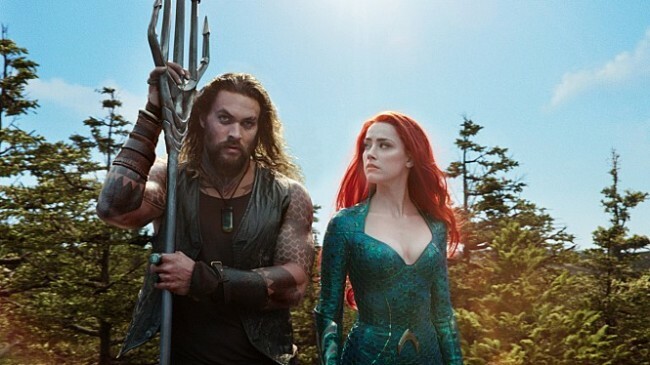 Mera’s interaction with Arthur -- leading the bumbling idiot on a path toward becoming the true hero -- is admittedly by the book, but that is made somewhat endearing because of Heard and Momoa’s performance. They look like a smart but short-tempered big sister and a good ol’ little brother. Watching Willem Dafoe onscreen is always enjoyable, as was seeing him play Arthur’s mentor Vulko. A problem I had was that the villain was weak, as in most DC films. Patrick Wilson as Arthur’s half brother, Orm, felt bland and uninteresting. His character was written poorly, but Wilson’s performance didn’t add much in a bootleg version of the Thor-Loki relationship, containing sibling rivalry and an inferiority complex, though sadly void of any charm. The character of Aquaman’s nemesis Black Manta -- Yahya Abdul-Mateen II -- was pretty pointless, too. He is supposed to be the big villain in the next film. However, he delivered so little in this film despite getting plenty of screen time. The plot is nothing new: a standard hero finds his true self and his rightful place. And the movie just keeps going on. It feels a lot like it should be about 100 minutes long, with simple, charming characters and fun action. But it goes on for 143 minutes. To Wan’s credit, everything was visually impressive. I absolutely adored the opening scene where the miniature lighthouse seamlessly transitioned into the opening sequence at the actual building. Atlantis looked amazing and original in its design, color and technology. Overall, it’s not top-notch quality, but a goofy film with a goofy protagonist, a visually stunning world and fun action sequences. “Aquaman” hits local theaters on Dec.19.